Bike Hanger Hook: it doesn't get more simple (or cheap, $9.99) than this. 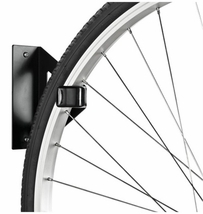 Mount the bike hanger to your wall and then hang your bike's tire on it. The bike hangs vertically for efficient storage in an apartment, closet, shed or other tight space. Grab a couple if you have a couple of bikes. 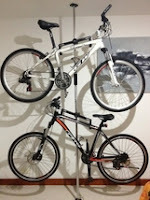 For a different option, we also have a Ceiling Bike Rack Hoist. Pressure-Mount Apartment Bike Rack: the ultimate bike rack for a rental space or college dorm because it has no screws - and therefore no holes in your walls and no lost security deposit. The center pole uses a pressure mount that spans from the floor to the ceiling to secure your bike, and adjusts all the way up to 9 feet 6 inches so fits most rooms. Innovation. Free-Standing Bike Rack: super simple yet very efficient design allows you to double your storage capacity for your bikes. 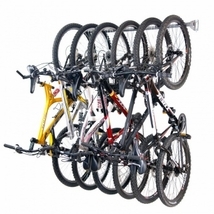 This rack has upper and lower level rack arms, so your bikes stack one above the other, each stored horizontally. Easy in easy out for when you're headed out on a training ride or a casual trip to the beach. Have more than 2 bikes? This rack comes in a 4 bike version also. Vertical Bike Hanger Rack: if need to store multiple bikes, this rack is a much more robust option than the bike hanger hook; it is a horizontal rack with 4 "J" hooks along a rod that can be slid to adjust for 4 different sized bikes. Great for garage and basement spaces and for those with a serious bike collection. 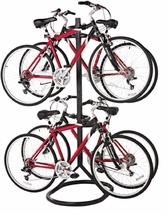 Have an even more serious bike collection - get this rack with capacity to store 6 bikes! Don't see what you're looking for? Yes, we have more bike racks on our website!